It has been forever since I have posted a recipe, so I wanted to share a super easy dinner that I threw together the other night. As you may already know, I am obsessed with basil. I buy a plant every spring, name it, and we hang out. It gives me delicious leaves that I either put in smoothies, pasta, or use to whip up some homemade pesto. I realized that I have had pesto incorporated into my meals at least 5 out of the 7 days last week, but I wasn’t satisfied with the quality. I decided to change up my regular chicken with pasta and veggies in lieu of a fresh batch of pesto. The whole meal comes together in less than an hour and was really easy to make. 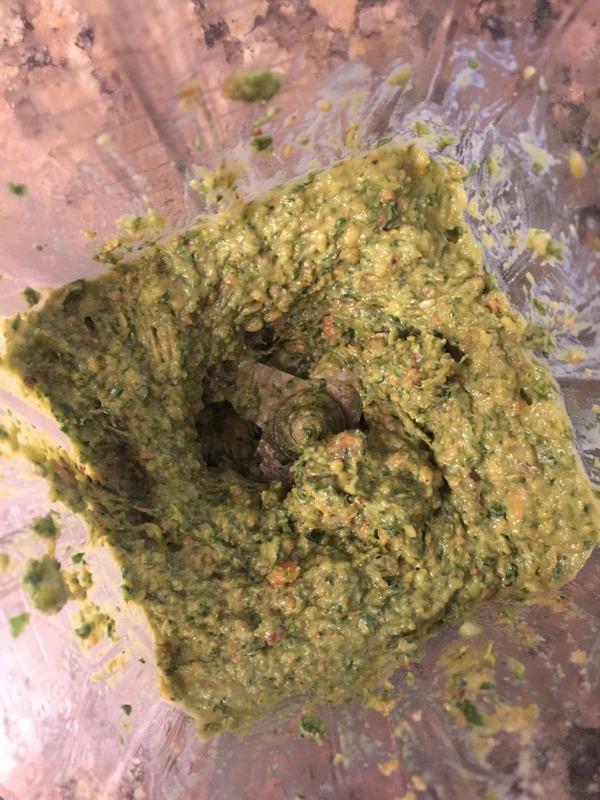 I have been making my pesto with pistachios and it’s delicious! 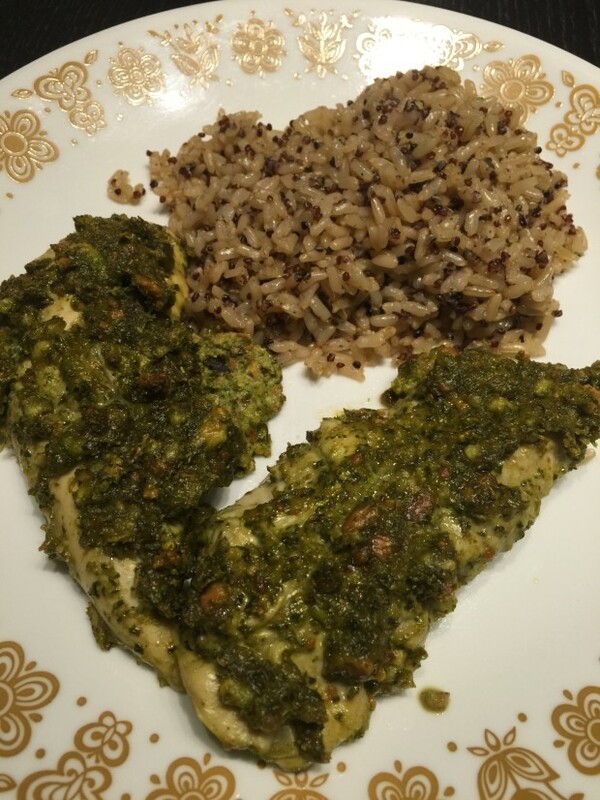 I paired the chicken with some of the quinoa/brown rice blend that I picked up from Costco last week. It takes 90 seconds in the microwave and serves two. Perfect! Place all ingredients except oil in blender or food processor. Turn machine on and slowly add the oil. The final product should still have a bit of texture to it. Place tenderloins in a gallon sized bag. Scoop all the pesto into the bag and coat the chicken like a marinade. You can either put in the fridge for a couple hours or bake immediately after coating depending on the time you have available. Spray a glass pan* with cooking spray or olive oil and place the tenderloins inside. 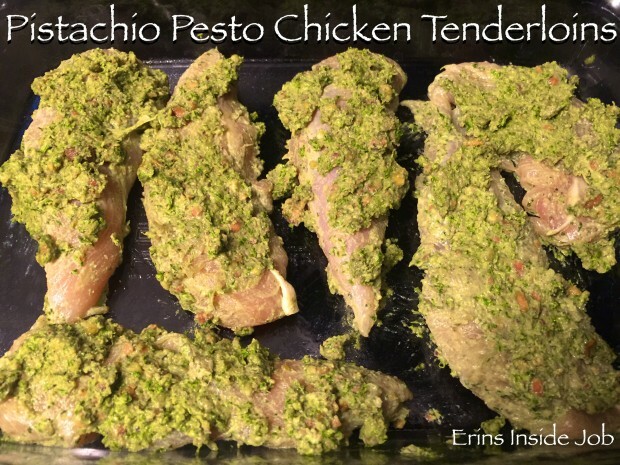 Make sure that each tenderloin is evenly coated with pesto. 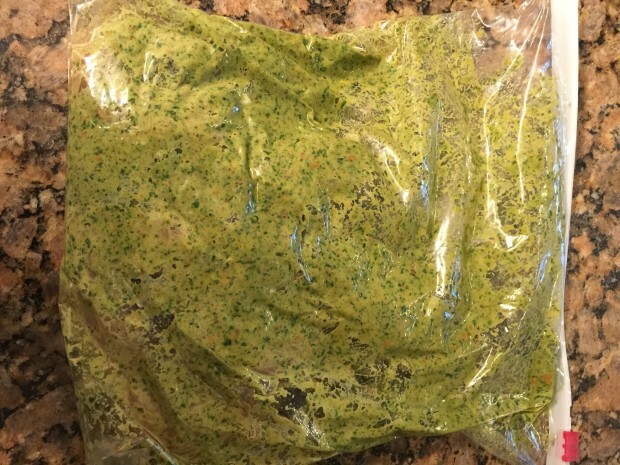 You can flip the gallon bag inside out and scrape the sides to remove any residual pesto. Cook tenderloins for 20-25 minutes. * If you don’t have a glass pan, you can also use a cookie sheet with a lip around the edge to catch any juices. Remember that a darker pan requires less cooking time. I would start with 20 min if employing this method. Baking the pesto makes it come out darker, so the pictures don’t look nearly as good as the taste. Enjoy! mmmmmm this looks fabulous! 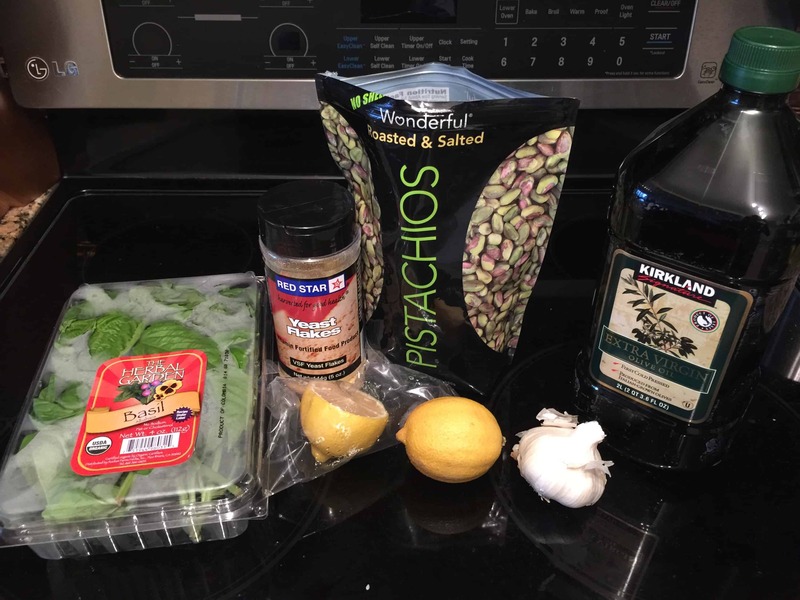 I love love love pistachios, and pesto (though I have to make it myself because of the oil quotient) and fresh basil might be one of my favorite things of all time. noms. noms. noms. I know I just saw that you had a recipe for it when I went looking for dinner inspiration last night on your site. You may want to check the link out though bc when I tried to click it I kept getting an error.